After 36 years Lowe Campbell Ewald has returned to Detroit on January 21st moving all 500+ employes from Warren Michigan. The new headquarters building is located in the 1920’s J.L. Hudson Co. warehouse attached to the Detroit Lions football stadium Ford Field with 122,000 square feet of space. 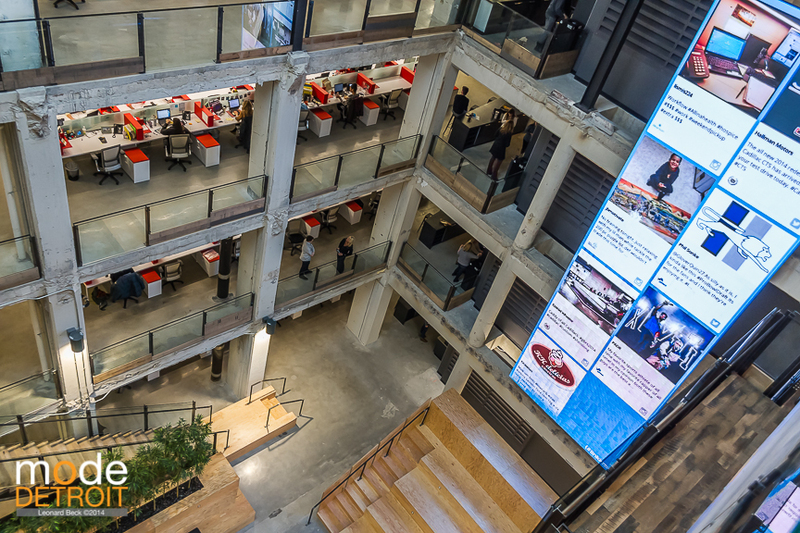 LCE worked with Detroit-based Neumann/Smith architecture to transform 5 floors of this older building into a modern workspace fit for a top full-service ad agency. Concrete, brick, steel girders, and natural woods give the space a industrial/urban feel with modern technology, which is exactly what you would expect from Detroit. Sustainable and reclaimed materials were used as much as possible throughout the building including barn wood and plastic. Most of the furniture was manufactured in Michigan. Stacked wood pallets used as legs for tables was really a creative idea you don’t see often. 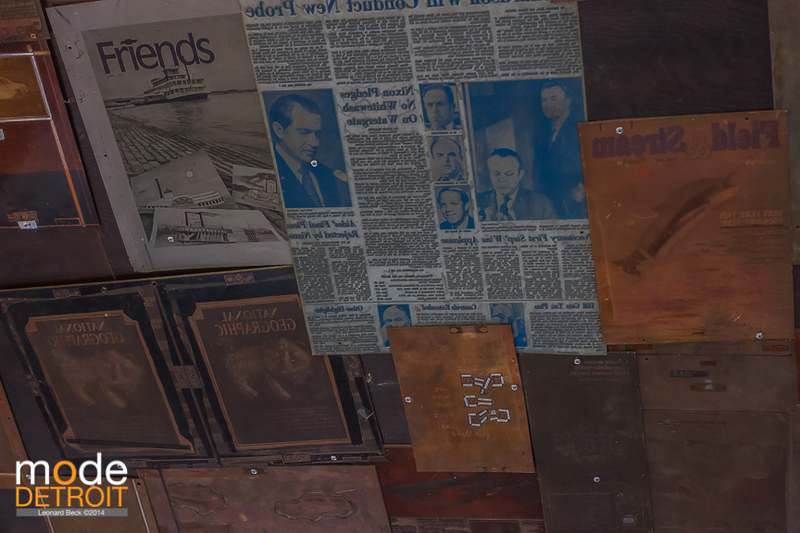 Some of the agencies 100+ year history of work is showcased on the ceiling as you enter the main lobby with layers of brass printer plates. What better way to inspire employees walking into work and visiting clients? LCE strive for interaction between employees is shown with over 100 collaboration work areas. Two indoor tree houses with a connected walkway is a really interesting feature. Are you brave enough to climb up there and work? It’s not for those scared of heights. The outdoor patio has a great view of the Detroit Tigers Comerica park. I expect it to always be filled in warmer weather. The large indoor patio is perfect during the winter with plenty of tables and chairs along with a foose ball table. Who could ask for more? Pool table? They have that too. With such a large open floor plan and expansive grand center area the three-story LED video wall is perfect to show off any new updates for anyone passing by the center of any level. Detroits future depends on passionate companies like Lowe Campbell Ewald moving into the city and being an active part of the community. They didn’t move here because there was a major incentive plan. LCE moved because they loved the city and wanted to be apart of its renewal. I run into LCE’s employees at events downtown all the time and can see their dedication to its revitalization. They are not just promoting collaborating within their agency but throughout the community to fuel change. Your company can too. Have you seen the http://votefordetroit.com video? LCE’s Group Digital Creative Director Iain Lanivich created a video about the agencies move back to Detroit in an effort to speaker at the next SxSw conference and encouraged others to make the move too. Show your support for the D!